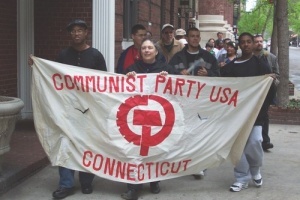 Joelle Fishman chairs the Connecticut Communist Party USA. She is a Commissioner on the City of New Haven Peace Commission, serves on the executive board of the Alliance of Retired Americans in Connecticut and is an active member of many economic rights and social justice organizations. She was a candidate for Congress from 1973 to 1982, maintaining minor-party ballot status for the Communist Party in Connecticut's Third Congressional District. As chair of the CPUSA Political Action Commission. ...she has played an active role in the broad labor and people's alliance that defeated the ultra-right in the 2008 elections and continues to mobilize for health care, worker rights and peace. She is married to Art Perlo, the son of late Soviet spy Victor Perlo. New Haven People's Center coordinator Joelle Fishman was born in 1946 in the working- class town of Camden, New Jersey, to George Fishman and Edie Fishman, both children of Jewish immigrants from Philadelphia. After graduating from Douglass College, at that time the women’s college at Rutgers, Joelle Fishman moved to New Haven in 1968 and has lived in the West River area ever since. She met her husband Art Perlo in the early 1970s while taking classes in Manhattan, and they have been married for 36 years. Upon graduating, she e moved to New Haven, where she met Sid Taylor, the plumber who then chaired the CPUSA’s Connecticut chapter. He organized her first job in the party, running the chapter’s bookstore on Broadway. Soon enough, she was commuting to New York for classes at a party-run school in Manhattan. From its early stages, the party proved a breeding ground for some of the most important friendships in Joelle Fishman’s life. One was with Sid Taylor, who acted as her mentor during her early years in the party. Every day for the four years she ran the bookstore, she would call him at 4:00 p.m. and pick his brain on current events. “He was a fabulous human being,” she says, “a worker-scholar.” Meanwhile, down in Manhattan, she became friends with a party organizer from Westchester County named Art Perlo, and they eventually married. She would run for Congress in Connecticut’s Third District every two years from 1974 to 1982, with her best campaign in 1976, when she received 1.7% of the vote. Defending Obama brings out in Fishman an ideological flexibility surprising for a leader of a movement often caricatured for rigid thinking. Conservative efforts to label Obama a socialist are “ridiculous,” she says angrily, “because that’s not what he is. But it’s also ridiculous,” she continues, because it’s suggesting that “socialism is a bad word, which it’s not, and which loads of people in this country are coming to understand.” Joelle believes that Obama is only the first step. The real change will come later. In January 2010, people gathered at Shiloh Missionary Baptist Church in New Haven to march in honor of Dr. Martin Luther King, Jr. The veritable anthem of the civil rights movement, "we shall overcome," rang through the streets as the group marched through East Rock neighborhood, each with a special story to tell. "I had been in DC in 1963 during the great civil rights march in which Martin Luther King gave his 'I have a dream' speech," Joelle Fishman of New Haven said. "I had picketed in front of the Woolworths 5 & 10 stores against segregation and I was part of the civil rights movement, and so this was the way of keeping that movement alive and growing." "Dr. Martin Luther King was a man for justice for all people," Kathy Bridges of Hamden said. "I feel the same way. I feel taking part in this day is living Dr. King's dream." Joelle Fishman, Connecticut, was on the list. On March 30 2002 the Communist Party USA paper People’s Weekly World called for a national holiday in honor of late Farm Workers Union leader Cesar Chavez. The article was followed by a long list of endorsersincluding Joelle Fishman, Almost all endorsers were confirmed members of the Communist Party USA. Joelle Fishman is a prominent Connecticut Communist Party USA activist and chair of the CPUSA’s Political Action Commission. In January 31 2004 Fishman addressed the addressed the Communist Party's conference on the 2004 elections in New York City. Joelle Fishman's role in the Communist Party USA's Political Action Commission gives her responsibility for organising party support for "progressive" Democratic Party candidates at the state, congressional, senate and presidential level. Like virtually all Communist Party USA members, Joelle Fishman personally campaigned for Barack Obama. On December 6, 2009, Fishman spoke at the 2009 Amistad Awards which was held at the New Haven People's Center. More than 100 activists endorsed the call, including Joelle Fishman. 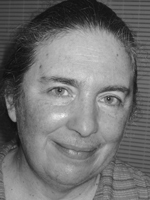 Joelle Fishman is the chair of the Communist Party, USA’s Political Action Commission and the district organizer for the Connecticut Communist Party. She is a Commissioner on the City of New Haven Peace Commission, serves on the executive board of the Alliance of Retired Americans in Connecticut and is an active member of many economic rights and social justice organizations. She was a candidate for Congress from 1973 to 1982, maintaining minor-party ballot status for the Communist Party in Connecticut’s Third Congressional District. Those invited to participate on on Facebook included Joelle Fishman. This page was last modified on 26 April 2017, at 10:36.